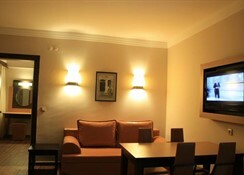 Family vacation time is fun and affordable at Club Alpina. Resting in the quiet residential area of Armutalan within the popular summer resort of Marmaris, this 4 Star complex has a dazzling beach 3 km from the hotel, 83 attractive one-bedroom apartments with self-catering facilities, plenty of sports and games to play, a restaurant and bar, kid's play area and water slides, and friendly service. Catch one of the Dolmuses (mini busses) running from morning till night from Armutalan into the centre of Marmaris, the marina, and the beach. Armutalan's night life is somewhat subdued and Marmaris is known for its effervescent clubs. Your apartment has kitchen facilities so you can make snacks or meals and there is a mini market for provisions. 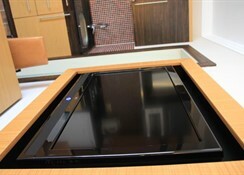 There is also a restaurant, poolside snack bar with a TV, a lobby bar and a café bar. Theme nights and BBQ nights are a treat not to be missed. There is a lot going on at Club Alpina. 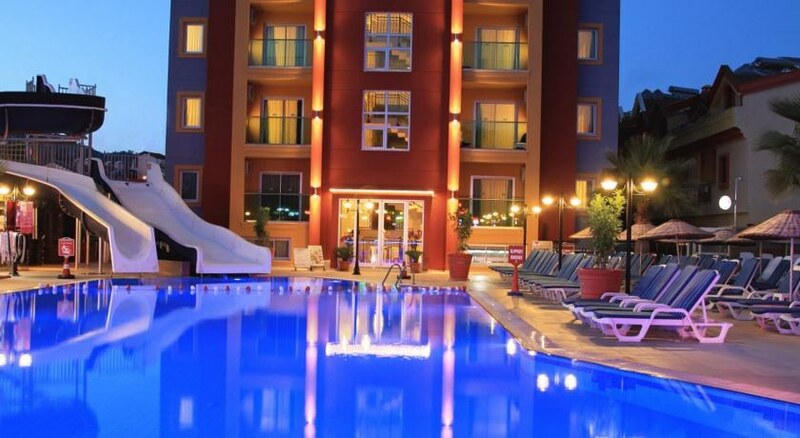 Swimming pools with water slides and a whirlpool, a kid's pool and play area, great terrace with sun beds and umbrellas, table tennis, pool table, darts, animation activities and a Spa area with a Sauna, Turkish bath and massage services. There are 83 apartments located in the original and new parts of the hotel. 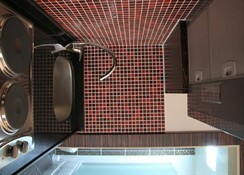 All of the units are clean and tidy with bold colours and comfy beds (including a sofa-bed). There’s a hair dryer in the bathroom and the kitchen has a cooker, kettle and a fridge. You can ask for air conditioning (with charge) and rent a safe. Free baby cot on request. 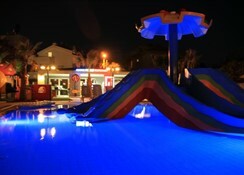 Dalaman Airports is 90 km from the Hotel.